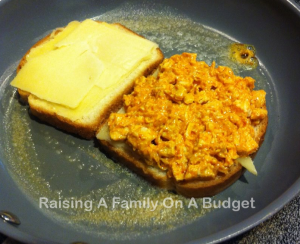 I am having some very odd cravings lately, and today’s hit around 7am – Buffalo Chicken! I don’t care for most prepared buffalo sauces because they taste very vinegary to me, so I opted to make my own. Here is the recipe for anyone looking to try a new Buffalo Sauce – maybe in time for the Superbowl this weekend! Melt the butter in a small pot. Reduce the heat to low. Add the spices and stir them in so you don’t get lumps. Add the bay leaf. Then, carefully pour in the Frank’s Red Hot. If the butter is boiling before this point, remove from heat so that it doesn’t bubble out of the pot and burn you. Whisk everything together and allow to simmer 1-2 minutes. Remove the bay leaf, and use on wings or as a dipping sauce or in your favorite recipe! For me, that became a Buffalo Chicken Grilled Cheese! I was making a buffalo chicken grilled cheese & a regular grilled cheese which is why there are 2 sandwiches in the photo. In a bowl, combine the cooked chicken breast and the buffalo sauce to coat. Stir in the bleu cheese crumbles (if using) and 1 spoonful of the bleu cheese dressing. If you don’t care for bleu cheese dressing, you could use ranch or mayo. Stir so everything is mixed together. Build your sandwich. Two slices of cheese on the bottom, a layer of buffalo chicken, and 2 more slices of cheese on top. Butter the top slice of bread, but don’t put on the top slice just yet. In a frying pan, melt some butter. Place the open-face sandwiches in the pan and cover with a lid. Cook on med-low until the cheese starts to melt and the bread is getting toasty. Put the second piece of bread on each sandwich, and flip. Cook on the second side until the bread is toasty and all of the cheese is melted. Allow sandwiches to cool for 1-2 minutes before slicing. Serve with additional bleu cheese dressing for dipping. I never said this was healthy or low fat. You can also make mini sandwiches using the appetizer breads that you can find at the deli and have a spin on the usual buffalo wings for the big game!